Christopher Godwin is a freelance writer from Los Angeles. He spent his formative years as a chef and bartender crafting signature dishes and cocktails as the head of an upscale catering firm. He has since ventured into sharing original creations and expertise with the public. Godwin has published poetry, fiction and nonfiction in publications like "Spork Magazine," "Cold Mountain Review" and "From Abalone To Zest." Roasted salmon is a classic, simple dish that can be cooked for a large group or for a single person with little change in preparation methods. Roasted salmon makes an excellent main course for lunch or dinner when served with a crisp green salad or sautéed green vegetables, and leftover portions can easily be reheated or used to make a cold salad the next day. Pair roasted salmon with a dry white wine such as Sauvignon Blanc or Chardonnay if desired. Lightly brush the bottom of a baking dish or roasting pan large enough to hold the entire salmon fillet with extra virgin olive oil. Place the fish inside the baking dish flesh side up. Brush the top of the salmon with a light coating of extra virgin olive oil. Season the fish with freshly chopped or dried herbs to taste. Sprinkle sea salt or kosher salt and freshly ground black pepper over the top of the fish to taste. 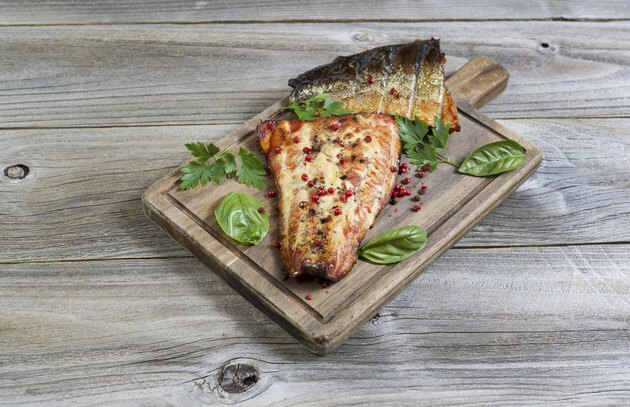 Place the salmon fillet in the oven for 15 minutes for rare cooked fish, 17 minutes for medium and 20 to 22 minutes for well done fish with a flaky, lightly browned top. Remove the salmon fillet from the oven, and allow it to rest at room temperature for five minutes. Transfer to a large serving platter or plate with fresh lemon wedges. Cut the fillet into smaller portions after resting, if desired. Increase the cooking time as needed for every additional pound of fish. For example, a 2-lb. fillet will take approximately 30 minutes to be cooked to the rare point, and a 3-lb. fillet will take about 45 minutes. Fresh or dried dill is a common herb used to season salmon. Use dried dill sparingly, as it has a fairly intense flavor. Freshly chopped parsley is often used to flavor and decorate salmon after it is cooked. If you know you are going to be making extra portions to eat the next day, remove the fish about halfway through the cooking process so it can be finished right before serving. For salads or cold recipes, cook the fish fully and store it in an airtight container overnight.